Welcome back to Global From Asia- our first interview in our re-launch – Global From Asia 2.0 – and I am ready more than ever to make MOVES and get everyone rocking and rolling. Today we are talking about leaving China. I know, I left China last year. But Rico and I – we are not China haters. Man, I love China – my wife is Chinese and my kids are halfies. But for many of us- we are not “China for Life” (Ok, Zack Franklin, you’re a China 4 Life guy) – for some who never go to China – who buy off Alibaba or use a sourcing agent like Rico or Insight Quality – or come for the trade shows or a factory visit. For others (heck, even me) we go for some time and then setup operations there and have it run remotely. And that is what Rico has done / is in the process of doing. And today we talk about that, so let’s tune in. After the show I’ll share my story of coming to China and how long I planned to stay. You’ve been on a few times – and I’ve been on your show a few times – Made in China podcast, how are you? 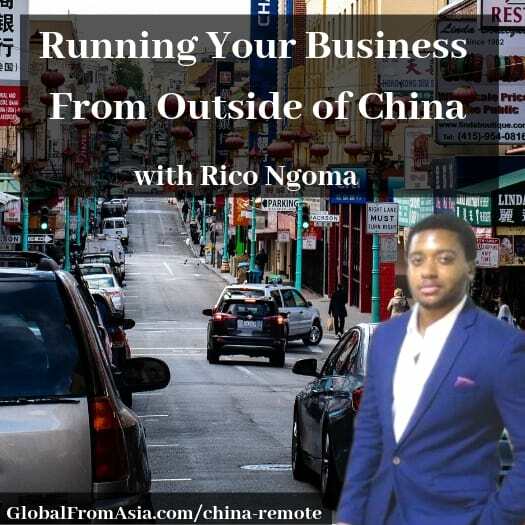 Been over six months as of the recording, and Rico you’re now transitioning to spending less time in China. But it’s all love – no hate – I miss China in a lot of ways. Rico found some nice perks while networking once out of China. Rico’s experience in building up a team and a manager. How are you keeping her interested and invested for the long term? Discussing Steve Marsh’s lawsuit in China with his previous staff. Warning Rico a bit and Rico’s response. A challenge is money flow – when you’re not in China – how do you deal with it? Let’s learn what Rico is up to now. That is a wrap. I mentioned I have interviews already done and wasn’t sure the order. We have some other fun and informative ones coming too – so make sure you subscribe (or re-subscribe) and bring things back better than ever. And for those who listen to the audio, I’ll be sharing at the end of this mp3 the story of how long I planned to stay in China and what actually happened, enjoy.